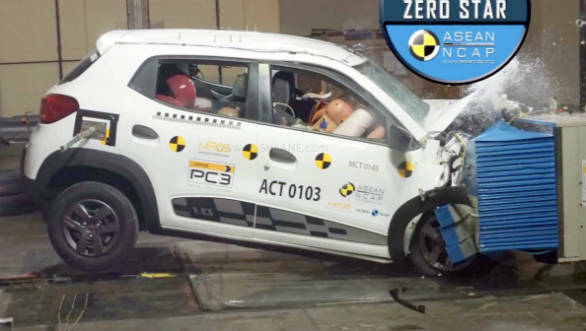 The Renault Kwid has failed the ASEAN NCAP crash test, scoring zero stars. The car being tested was the Indonesia-spec car and scored 24.68 points according to the organization's scoring system. The car that was tested was equipped with just a driver's side airbag. The NCAP test scores take into account an aggregate of three categories - adult occupant protection (AOP), Child Occupant Protection (COP) tests and safety assist technologies (SAT). The Kwid scored very low points in the AOP and COP categories. It scored nothing at all in the SAT category, given the absence of basic safety equipment like ABS, ESP, seatbelt warning, passenger airbags. This is not the first-time the Kwid has performed pathetically in such tests. The Indian-spec Kwid failed a similar test back in 2016, after which it scored a one-star rating when Renault India made some improvements. The Brazilian-spec car fared relatively better when it was tested in 2017, scoring a three-star rating. While it is understandable that cost-effectiveness is a big factor in developing markets like India, compromising on basic occupant safety is an unacceptable way of achieving this. Th upcoming safety regulations that bring new crash test standards, mandatory airbags and ABS will be a major step forward in addressing this issue.